Should I Buy A Used Or New Car Seat For My Baby? Should I Buy A Used Or New Car Seat? There is a natural inclination to purchase a new car seat for the baby for a number of reasons. A new car seat has no wear and tear, it should represent the latest in car seat technology, and it should also be crafted from the best materials that provide strength and durability while being lightweight and easy to carry. Plus, you will get the instruction manual that tells you how to use the seat and the features that it offers. Check out our latest car seat rankings! Click here to see the newest rankings! There are a number of reasons why obtaining a new car seat is worth the extra expense over a used one. Even if the older model was barely used, there are still strong reasons why a new one is best for your baby. Warranty: If you purchase directly from the manufacturer, then you get a warranty that covers the seat in case of any manufacturing defect or issue that arises. A used car seat does not come with such guarantees which means that if something is inherently flawed on the used seat you purchase there is nothing you can do about it except replacing it. No Previous History: You know the history of a new car seat because it came fresh from the factory. A used car seat is a different story if you purchase it at a garage sale or flea market. Perhaps it is in great shape, perhaps not. The difficult part is that you will not really know until something happens and that may be too late. Instruction Manuals: The manuals that come with every new car seat are most often missing when you purchase a used one. Plus, many car seat manuals are not available from the manufacture if they have not been made in the past few years. This means that you are missing important information about how to secure your baby in the seat, how to secure the seat in the vehicle, and what adjustments need to be made as your baby grows. Safety Innovations: While car seats have seemingly changed relatively little since they were introduced a few decades ago, the truth is that they have undergone rapid changes in terms of safety, quality materials, and how the baby is secured. A car seat made today is substantially superior to one that was made only a few years ago. This means that you get the latest in safety features when you purchase a new car seat. While a used car seat may seem like a bargain at first, the truth is that you will want to maximize the protection for your baby by purchasing a new car seat. Thanks for reading! 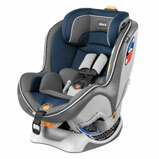 Click here to see the newest car seat rankings!